Earn up to 1,016 reward points. Get all the delicious overdrive of a tube amp in this enhanced, V2 OCD. The Fulltone OCD V2 (Obsessive Compulsive Drive) overdrive pedal packs classic OD tones into a compact pedal with simple, no-fuss operation. From heavy crunch rich with overtones and feedback to spanky cleans, the OCD delivers the sounds of a great tube amp, as sell as the same sensitivity and response to your playing style. Along with standard Volume, Drive, and Tone controls, the OCD V2's HP/LP (High Peak/Low Peak) switch takes the pedal from a clean boost to manic, sustain-laden distortion. True bypass switching. -Output buffer (when pedal is turned on in True-Bypass mode, or always when in Enhanced Bypass mode), which eliminates it from being influenced by effects that came after it. Translation: Your sound remains consistent regardless of placement in today’s more complex signal-chains, loopers and pedalboards. This buffer also had a positive effect on the sound, it reduced loading on the pedal’s hard-clipping stage, allowing more sustain of both the sound and the overtones. -Class A configured discrete 2N5457 JFET input section, raising the input impedance to 1 mega ohms (previously 330K) and increasing the dynamics. This results in significantly better interaction with both single-coil and humbuckers. -Internal switch to choose between ”Enhanced Bypass” and True-Bypass, and with no popping sound in either mode. 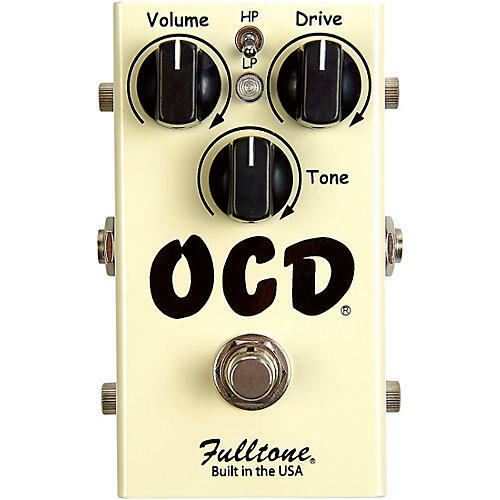 The Fulltone OCD V2 has slightly smaller “OCD” and “Fulltone” logos, along with “Built in the USA” under the Fulltone logo. Next, the In and Out jacks are placed exactly at the halfway point of the left and right sides on V2, whereas with all previous versions the jacks were located more toward the bottom. All Fulltone pedals are hand-built and tested at their shop in Southern California, using full-sized top-notch components.